One day a year 900 people are allowed inside the Tsukuba Branch of the National Museum of Nature and Science. The Museum itself is located in Ueno Park, Tokyo. The Tsukuba branch is a warehouse and research center in which millions of specimens (stuffed and mounted animals, fossils, rocks and gems, and human bones, etc. ) ae carefully stored. On the Open-to-the-Public-Day visitors are let in in groups of 30 for a special tour. The National Museum of Nature and Science in Ueno Park first opened its doors in 1871. It has the most important natural history collection in Asia and also a fine collection of machines of great historical value – earlly steam locomotives, a zero fighter, etc. Besides its first-rate standing exhibition, its curators put together all sorts of blockbuster “special exhibitions” – and millions of people visit every year. Few people know that there is a braanch of the museum in Tsukuba – insread of millions of visitors a year, though, it gets exactly 900 – the number that is let in on the single Open-to-the-Public-Day the facility hosts every year (always in April). Why only one day a year? Well, the facility is not built for having visitors. It is a warehouse of sorts ( a very expensive and secure one) for keeping and studying the 4 million specimens in the museums collection that are not on display in Ueno. In fact, having any visitors seems like a tremendous hassle for the staff – though they are very kind and welcoming – and a challenge to the building itself – since it is designed to maintain sterile and atmospherically controlled conditions to best preserve the collection. As I neared the entrance, I could get a glimpe of a very rare and shocking site in Tsukuba 8or anywhere else for that matter!) 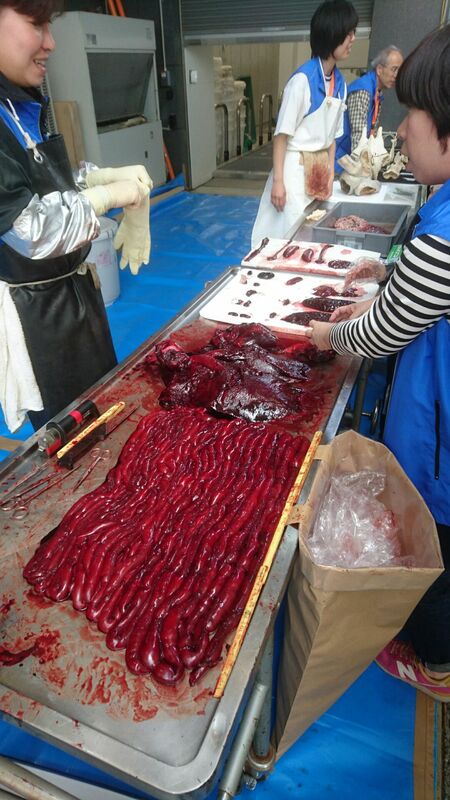 – a dolphin being dissected! the poor critter had been found wshed up on a beach somewhere, and the the biologist were performing an autopsy to try and discover its cause of death. I never did ffind out what the verdict was, though (couldn`t find it on-line, either). We were first let into a huge indoor loading dock (in a group of 30 people). 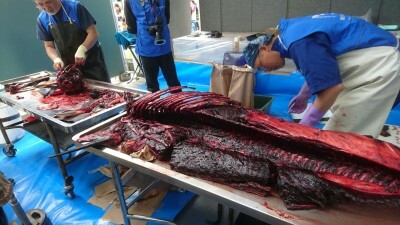 This is where all specimens, including elephants and whales are unloaded (therefore the large size). IT is a state of the art garage with a sophisitcated fire-extinguishing system (that would endanger any human who didn`t make it out of the building on time – at this place the collection has priority over the lives of the staff! When our guide asked where we`d come from, most were Tsukubans, but a few had come up from Tokyo – and more than ten of us had been to the event more than once before. The rules were quite strict – no stepping off the blue sheets that had been laid down, no eating or drinking – and most stressful for me – NO PHOTOS! IT was also neccessary to move as a group from room to room- and it reminded me in a way of the movie Willie Wonka`s Chocolate Factory. The first room they took us to was the animal room – thousands of stuffed and mounted beasts creating a macabre menagerie. We could touch several specimens that had been prepared for us.It was my first time to hold a rhino horn (and no, i didn`t asl how they obtained it – I was the only foreigner and didn`t want to ask controversial questions- sorry!) They also gave us a little lecture, on giraffe anatomy, with all the body parts there to illustrate the points made. The next room was the fossil room – and after that we were taken to the human remains room! There, are the skeletal remains of thousands of human discovered at construction sites or at archaelogical excavations. Most “exciting” was seeing the skulls of the prisoners executed at the Kotsukappara execution grounds (located in what is now Minami Senju) whose remains turned up when the Tsukuba Express Station and tracks were being put in. After that we saw the gem room- and then the formalderhide room- a bit smelly! And that was it ! 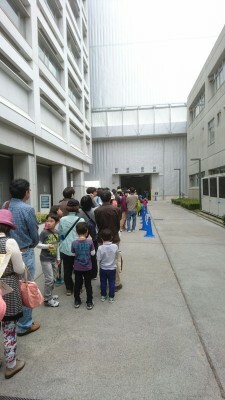 Really quite an amazing experience – I`ll have to wait till next year to wait in line!